MOSCOW, August 27. /TASS/. 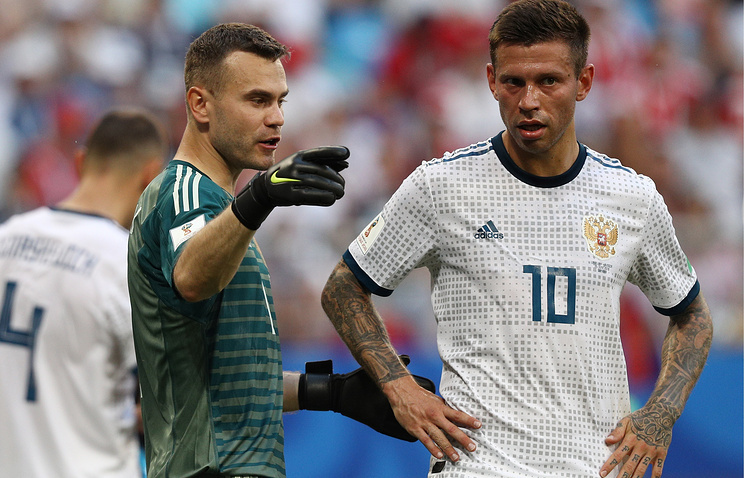 Striker Fyodor Smolov and goalkeeper Igor Akinfeyev will be absent from Russia’s line-up in an UEFA Nations League encounter with Turkey in Trabzon on September 7 and a friendly with the Czech Republic, in Rostov-on-Don on September 10 the Football Union of Russia said. Russia’s current national squad is as follows. Goalkeeper: Marinato Guilherme (Lokomotiv), Andrey Lunyov (Zenit) and Anton Shunin (Dynamo); backers: Georgy Dzhikiya and Ilya Kutepov (both from Spartak), Fyodor Kudryashov (from Rubin), Elmir Nabiullin and Igor Smolnikov (both from Zenit), Roman Neustaedter (from Fenerbahce, Turkey), Konstantin Raush (from Dynamo), Andrei Semyonov (from Akhmat), and Mario Fernandes (from CSKA); midfielders: Yuri Gazinsky and Dmitry Stotsky (both from Krasnodar), Roman Zobnin (from Spartak), Alexander Yerokhin and Daler Kuzyazyev (both from Zenit), Alexei Ionov (from Rostov), Ruslan Kambolov and Pavel Mogilevets (both from Rubin), Denis Cheryshev (from Valencia, Spain), Anton Shvets (from Akhmat) and strikers: Artyom Dzyba and Anton Zabolotny (both from Zenit) and Dmitry Poloz (from Rubin). The Russian football union’s website says the list may still change somewhat. The UEFA Nations League is a newly-introduced tournament expected to serve as a substitute for friendly games. All teams are distributed among four leagues from A (the strongest) to D (the weakest). In each league the teams play in groups. Russia is in Group 2 of League B. It is to play two matches with Turkey and Sweden each. The winner will go to League A while the team that will take third place will be moved to League C. The participants in the League of Nations will compete for four extra berths at UEFA Euro 2020. Hey Buddy!, I found this information for you: "Akinfeyev, Smolov to miss matches with Turkey, Czech Republic". Here is the website link: https://russophile.org/akinfeyev-smolov-to-miss-matches-with-turkey-czech-republic/. Thank you.